Your parents and teachers were correct to tell you to “sit up straight”. 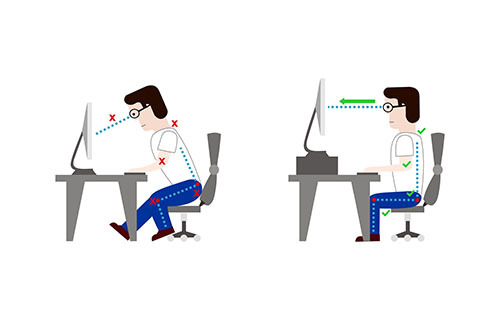 The constant forward flexed posture we have adopted every day to look at computer screens, tablets and smartphones is causing havoc for our spines, with major long-term degenerative consequences.This article will help you understand how poor posture develops, the consequences of this problem, and how to correct / reverse bad posture. There are the obvious traumatic causes of poor posture like motor vehicle accidents and falls which cause a violet flicking of your head, leading to an acceleration / deceleration injury which often bends your spine into an abnormal position. This new position of your spine may cause a rounded upper back and a forward head posture, one of the main conditions treated by a Chiropractor. By far the most common cause of posture related visits to a Chiropractor is from the stress and strain of daily life, and the most common of those daily life stressors is the excessive use of technology. 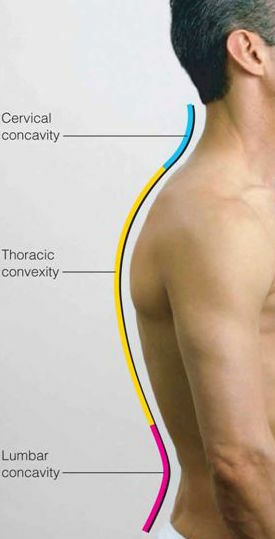 Forward bending (flexion) of your neck and upper back for hours each day to look down at laptops, cell phones, tablets or books is literally bending your cervical spine in the opposite direction to how the neck portion of your spine is naturally bent, and it is increasing the size of the already present thoracic (upper back) curvature. 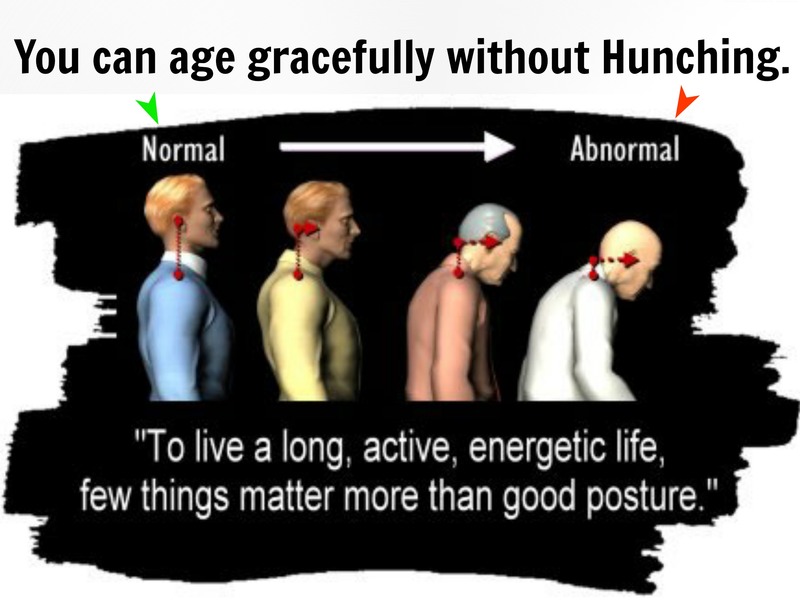 Over time, the cervical spine can lose its natural backward curved shape, a condition know as Loss of the Cervical Lordosis, and the curvature in the upper back can increase, called Increase in the Thoracic Kyphosis (Hunchback). 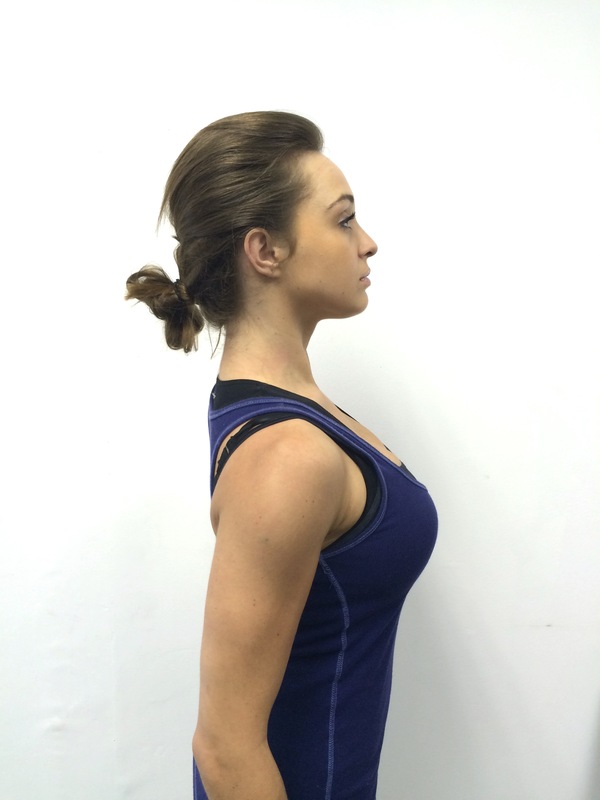 Long-term bad posture is leading to conditions like: Anterior Head Syndrome, Upper Crossed Syndrome and Text Neck Syndrome. These are the fancy terms to describe an effected person who often has a forward flexed appearance with a rounded back and shoulders, a head that sits too far in front of their body and possibly a Dowagers Hump in the upper back later on in life. These individuals find it difficult not to slouch, and standing or sitting up straight requires constant effort to achieve, it does not come naturally. 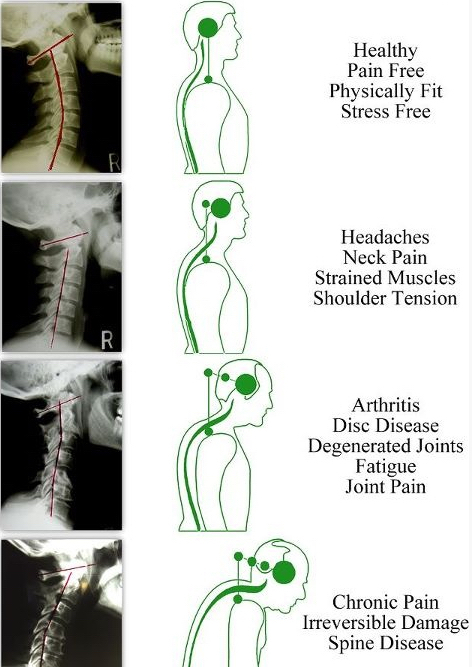 If no outward signs are present, they probably still suffer from the classic symptoms of long term postural stress, which include chronic upper back and neck pain, headaches, disc bulges and pinched nerves. Does this sound like you? Pinched Nerves: tingling, pins & needles, numbness, burning, pain or muscle weakness in the arms and / or hands. Perhaps the most concerning part of the bad posture story is what’s going to happen to the children of today when they grow up. For reference, the adults of today in their 30’s and older are facing serious postural problems and are in chronic pain, but their conditions are only related to poor posture as a result of their computer use during their adult working life. Adults of today did not spend hours a day on computers, smartphones and tablets when they were kids, because that technology never existed back then. Today, in some societies, children start using tablets at the age of 3, and they have a smartphone and laptop, which they use daily, before they reach their teens. Does this sound like your children? 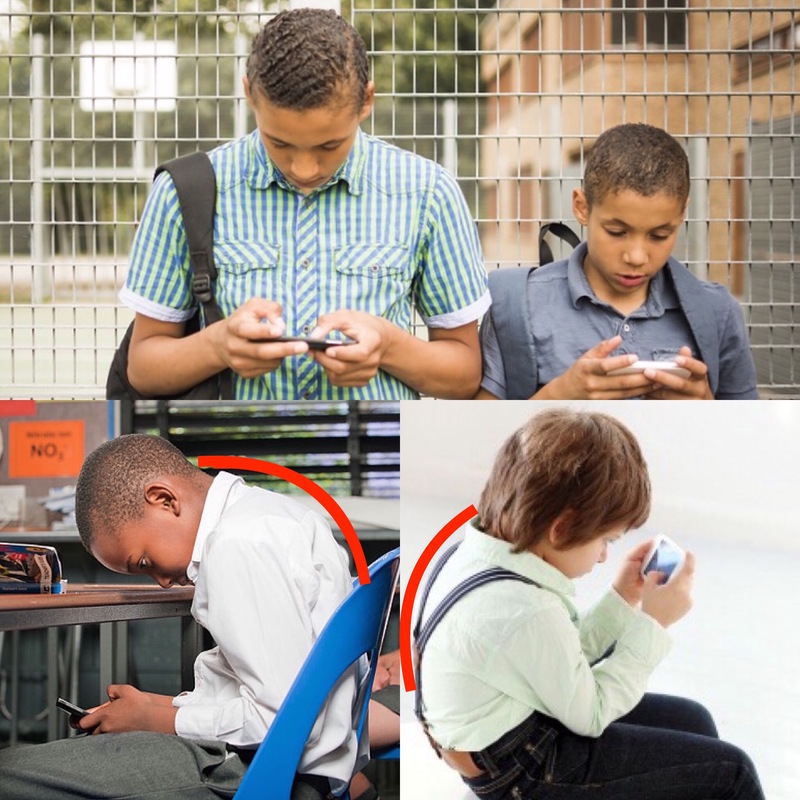 When the children of today are in their 30’s, and have had 10yrs of bad posture behind a computer, working their job, their spines will also have had 15-20 years of tablet, laptop and smartphone use as children/teenagers to contend with. Let that sink in. Their problems will be much greater than the ones we see in adults today. Firstly, if you want to save yourself / your children from a painful hunched back future, then limit your technology use per day, and make sure that when using a tablet, smartphone or laptop, that you don’t bend your entire upper back and neck forward to view the screen, rather raise it to eye level. Now get the Align-Yourself 60 days To Perfect Posture mobile App or ebook installed on yours and your children’s phones, and follow the exercise and stretching protocol outlined here: https://www.chiropractorjhb.co.za/posture-correction-at-home/ . Set an example at home and do it yourself, you most likley need it to reverse what you’ve done to your posture over the years. If you have great posture, don’t use technology at all, have never been involved in a sports trauma or motor vehicle accident, and don’t need any help yourself, then get your kids involved in healthy posture habits. Insist that if your kids are going to use their phones and computers for many hours a day, then they must reverse the negative long term effects by getting into a daily posture correction routine outlined in the protocol, which takes only 5mins a day. You will be helping them prevent a major problem before it ever occurs and are setting them up for good postural habits throughout their lives. 3. Lastly, get yourself and your family a spinal checkup, because normal spinal curvatures are vital to normal posture. Do it once every 6 months, or once a year, you decide for yourself what’s right, just do it. If you have been involved in an accident, or work a job behind a computer every day, then get this checkup sooner, rather than later. Our suggestion is to see someone who specializes in treating the spine and has a special interest in posture correction, like Sandton based Chiropractor, Dr Warrick Botha. Whether you decide to visit a Yoga or Pilates instructor, Personal Trainer, Massage or Physiotherapist, Biokineticist, Chiropractor or Medical Practitioner, it’s up to you, but we don’t recommend you see a generalist for your specific spinal postural condition, who also treats every other condition from head to toe. Generalists struggle to tackle the problems associated wth very specific conditions.